The Colorado and Fluted Indiana blades arrived! These are spinners for large predatory fish. 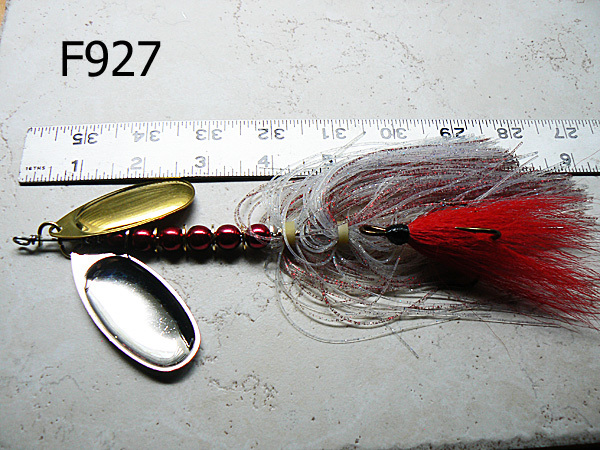 Takes a lot of hardware to build spinners above 2 ounces and almost 9 inches long. Lots of components. 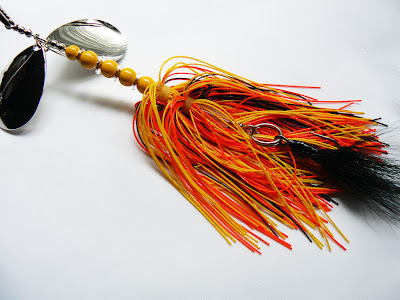 Double blades, double skirts, dressed trebles. Once you get the parts, they are a lot of fun to build though! I found that I had problems using the S clevis on the 2oz+ Double Bite Colorado blade spinners. Big Double blade spinners have a couple unique behaviors that can cause issues. Some blade types misbehaved and did not spin well. I found the #8 Colorado blades did not spin well in the S clevis. Indiana's worked, Fluted Indiana's worked, French Blades worked. Colorado's seemed too wide for the balanced S clevis to get the other side started. I believe the Colorado blade's more circular shape causes interference between the blades. When big spinners don't spin, it's immediately apparent. Early slow speed collisions between the blades kept them from both engaging and balancing out. The single Colorado blade on a single clevis worked fine. I tried a variety of changes, trying to solve the problem, increasing drag by adding a bigger buck tail, more weight adding more components, less weight removing components, just no luck with the S clevis and Colorado blades. I finally went to an intertwined two clevis blade attachment for the Colorado's. Two clevises provided enough flex and clearance during startup to allow both blades to start independently and not collide. This fixed the problem on the Colorado blades and also worked on other bigger blade styles. Lesson learned. Another symptom with the double blades, was that I got far more leader hangups. 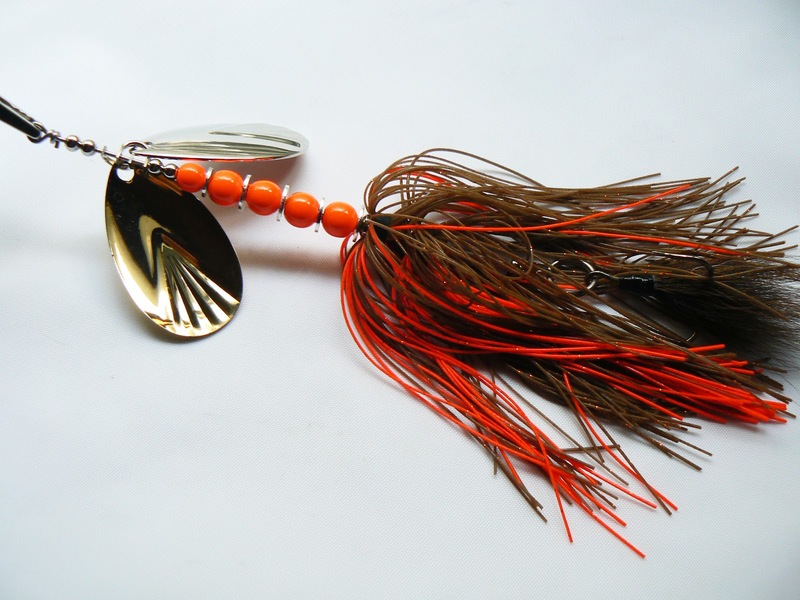 The leader's swivel would bind between the blades and stop rotation. That irritating retrieve where the blades are not spinning and the line or leader is wrapped or tangled between the blades. 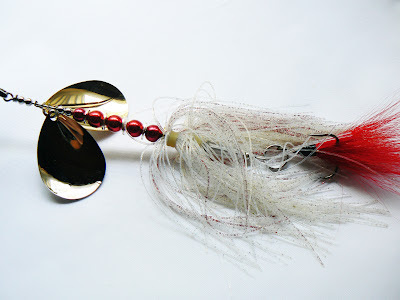 Sometimes it can happen on single blade spinners, but definitely more often on doubles. My leaders swivel clasp folded over as the spinner sank, deep enough, during some of the landings that the first blade rotation slipped over it and the metal to metal (clevis to swivel clasp) contact locked up the blade rotation. To solve this issue I added a couple of bearing beads above the clevises. The bearings moved the blades down the wire enough to avoid the metal to metal (clevis to swivel clasp) contact and let the cable slip out on the first rotation. A couple more beads fixed that problem. Much Better! Spinner misbehavior solved. This one has zonker strips banded on the 2/0 treble vs tied buck tail. Two bands, one for the fluorescent green then three shorter blacks and another band. 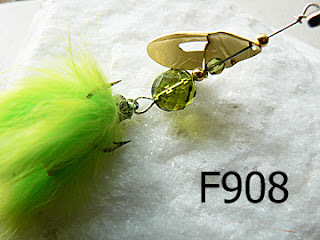 I like it, so will the fish! 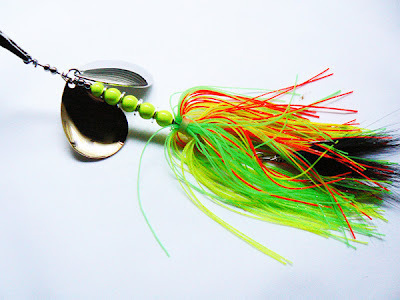 Ultra fluid when wet, lots of color combo potential and much quicker to dress a hook. 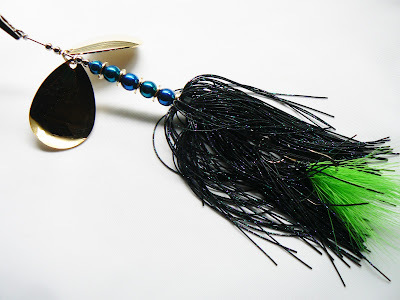 If you fish Muskie or Pike, you already have the tackle to fish these. 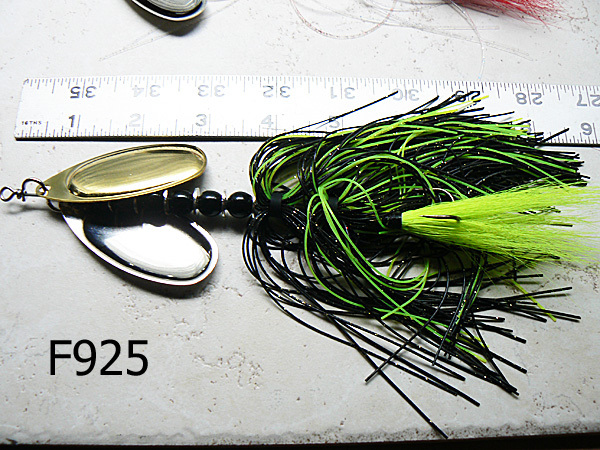 Put a few in your tackle box while the discount codes are still active! 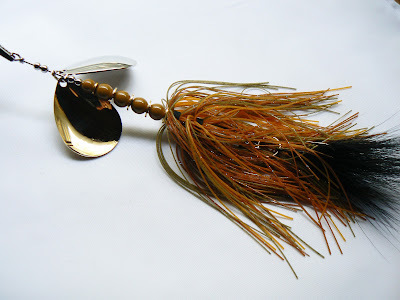 Challenged to beef up the 1oz skirted Armadillo, here's what I did to wake up a muskie. 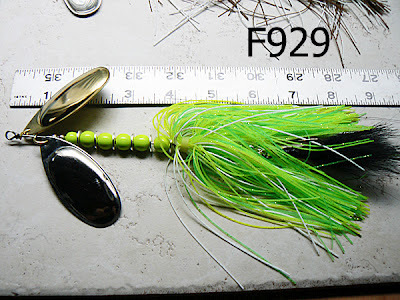 Bigger blades for more bite, more body beads for added weight and balance, doubled up the skirts for more tail drag, bigger #2/0 dressed treble. Then balanced everything during testing. Almost 9 inches long and 2.25 ounces. Packaged in clear reuseable tubes. The wires .051 inch stainless. 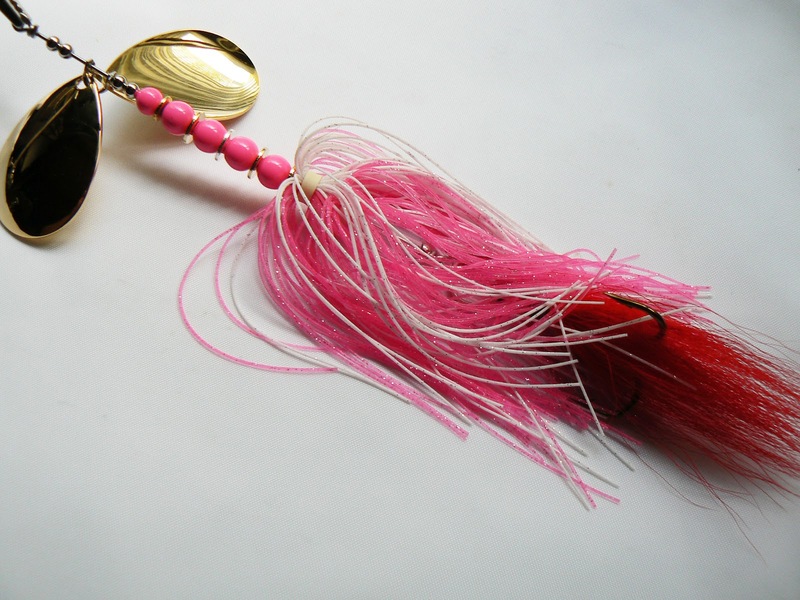 Body beads are powder painted 3/8oz solid marine brass. 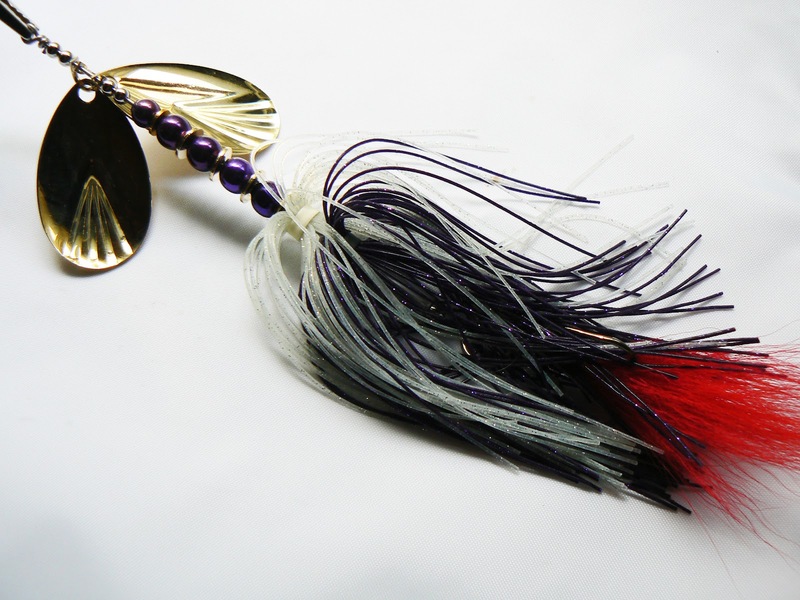 Transparent powder colors (red, blue, purple, green) uses nickel plated brass for extra luster. The blades on these, are heavy .032 gauge #8 French blades. 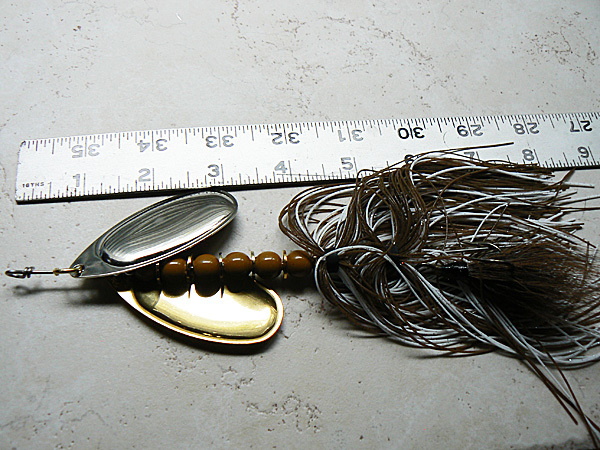 I've got .040 gauge #8 Smooth Colorado's and fluted #8 Indiana's ordered - Gold and Nickel mirror finish. Finishes like Nickel and Gold are added for scratch and tarnish resistance and reflection. Heavy gauge brass is soft. Most smaller blades are stamped from .018 gauge marine brass. When you package these big brass blades in the hundreds or thousands, they collide and scratch each other during shipping and storage. Polished brass doesn't fare as well as the finished blades. These heavy blades really move some water. If you fish them with your rod tip up, the rotation raises the surface leaving a wake trail. The surface disturbance will help large predatory fish take notice. No fishing in wake free area's, lol. Here's a few more pictures and some links. 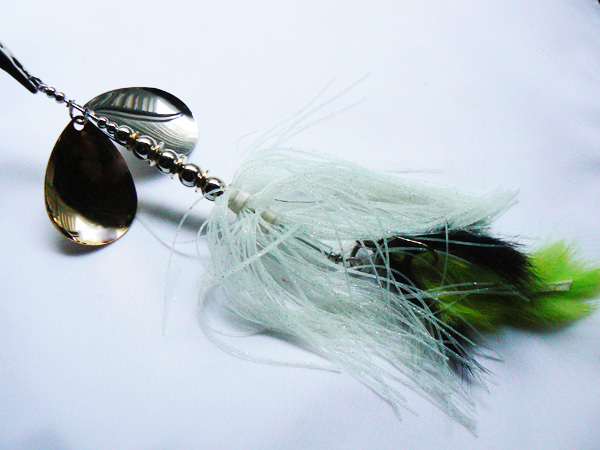 Spinners are listed separately in the bottom of the Large Spinner category, scroll down to find time! Back to building out some more colors! Kind of foreshadowed with prior posts, but here's this weeks Spinner of the Week. It's a new model and has 18 variations. 9 brass and 9 nickel. I thinking of expanding that by a couple; one with a brass bead and another with nickle. 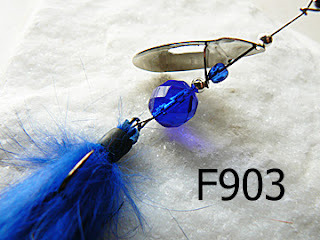 What's interesting (IMO) about this one is I built them with a slip loop on the hook end. This lets you change out hooks or replace the banded Zonker strips to change their color while fishing. Here's a couple pictures showing the process. 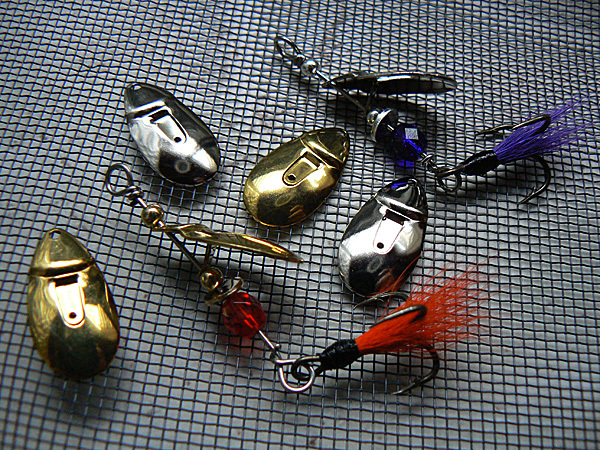 Endless color variations on the dressed trebles. Here's a 20% discount code good til the end of May - Junebug, should you want to put some in the water! OK, finally getting around to doing this drawing, I apologize for the delay. 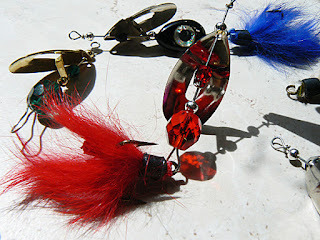 Looks like JLS from Ringgold, GA is our winner for the 12 trout spinners! No wait, all our customers are winners. 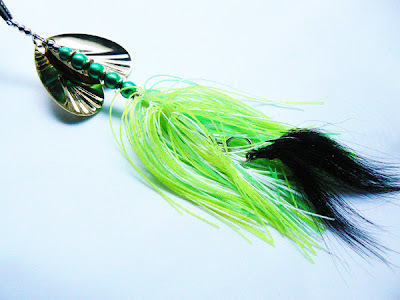 I'll send each of the seven runner up's an FCS care package of 3 spinner surprises, including one of the new June Bug models. 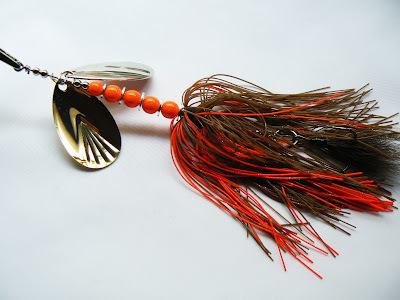 Send an email to - fishcreekspinners@gmail.com - with your address info and I'll get some spinners headed to your mail box! Get'em wet and send me a fish story! 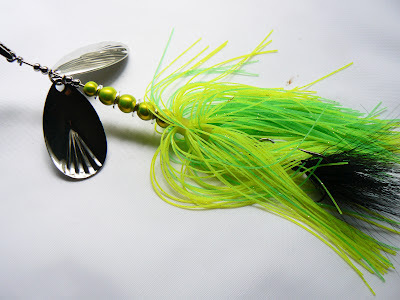 Here's one of the new June Bug spinners. Enjoy the spinners and Noise on the Line! Here's a new method for dressing trebles, that's quick and easy, just need a skirt tool. I kind of put two and two together to get here, and maybe it's been done and discussed before, but here goes. 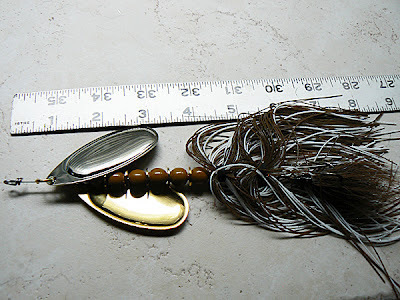 Like I said, you'll need a skirt making tool, some rubber skirt bands, some rabbit zonker strips, and of course; treble hooks. I bought a skirt making tool on a whim, about a year ago and never used it, opting to buy the skirts from Kayser. Kayser is a lure component company in Chicago. Terry's team makes great products and they're friendly people. They are eager to respond, and ship fast. Here's a slideshow. The slideshow is in Picasa and you'll need to click the color wheel in lower right twice to get the toolbar to show up. Then mouse over the bottom border to bring it back if it pauses, manually advancing at your speed. 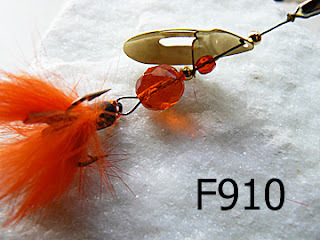 They're quick to make, plenty of primitive, but effective in the water. A nice addition to the June Bug Transformers. Time will tell. Leave a comment if you have an opinion. Back to the bench and some relaxing - mindless - repetition!